Aaron Equipment has a large inventory of reconditioned, unused, and used agitators. Aaron stocks a large inventory of side entering agitators, top entering agitators and parts. Agitators are used in chemical, food, pharmaceutical and cosmetics industries to mix liquids, promote chemical reactions and increase heat or cooling transfers. If you are looking to sell your used agitators submit a request online or contact Erik Eichert at 630-238-7480. 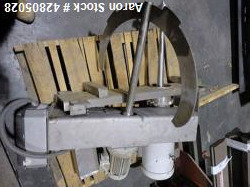 Used- Lee 50 Gallon Single Motion Sickle Agitator"